Monomoy Girl and Midnight Bisou, the two dominant 3-year-old fillies in the country, will clash for the first time Friday as they head a field of 14 entered Monday for the 144th running of the $1 million Longines Kentucky Oaks (Grade I) that serves as the centerpiece of Friday's 13-race program at Churchill Downs. The Longines Kentucky Oaks, run at 1 1/8 miles on the main track, will go as the 11th race with a 6:12 p.m. (all times Eastern) post time. If all 14 run, the winner's share will be $564,200. Owned by Michael Dubb, Monomoy Stables, The Elkstone Group and Bethlehem Stables, Monomoy Girl has won five of six starts for trainer Brad Cox. Monomoy Girl, the 2-1 morning-line favorite, has won both of her 2018 starts, the Rachel Alexandra (GII) at Fair Grounds and the Ashland (GI) at Keeneland by a combined 8 lengths as the odds-on favorite in both. Florent Geroux, who has been aboard in her past five starts, has the mount Friday and will break from post position 14. Allen Racing and Bloom Racing Stable's Midnight Bisou has run off three consecutive graded-stakes victories after coming up a nose short in her initial two starts. Trained by Bill Spawr, Midnight Bisou (5-2 on the morning line) has won her past three starts by a combined 10 ¼ lengths, all with Mike Smith in the saddle. Smith will be aboard Friday and break from post position 10. Smith, who has won the Oaks twice including last year with Abel Tasman, is seeking to become the first jockey since Eddie Arcaro won the Oaks three consecutive years (1951-53) to win in back-to-back years. Third choice on the line at 10-1 is Courtlandt Farms' My Miss Lilly. Mark Hennig trains My Miss Lilly, who enters the Oaks off a victory in the Gazelle (GII) at Aqueduct at the Oaks distance. Joe Bravo, who was aboard for the Gazelle victory, has the mount Friday and will break from post position 11. Adding a slice of foreign intrigue into this year's running is the presence of Sheikh Rashid Bin Humaid Al Nuaimi's Rayya. Winner of the UAE Oaks (Group III) and second to Kentucky Derby hopeful Mendelssohn in the UAE Derby (Group II) in Dubai, Rayya now is in the barn of three-time Oaks winning trainer Bob Baffert. Baffert, who got his third win last year with Abel Tasman will be attempting to become the first trainer since D. Wayne Lukas (1989-90) to win the race in consecutive years. Drayden Van Dyke has the mount on Rayya, listed at 15-1 on the morning line, and will break from post position seven. 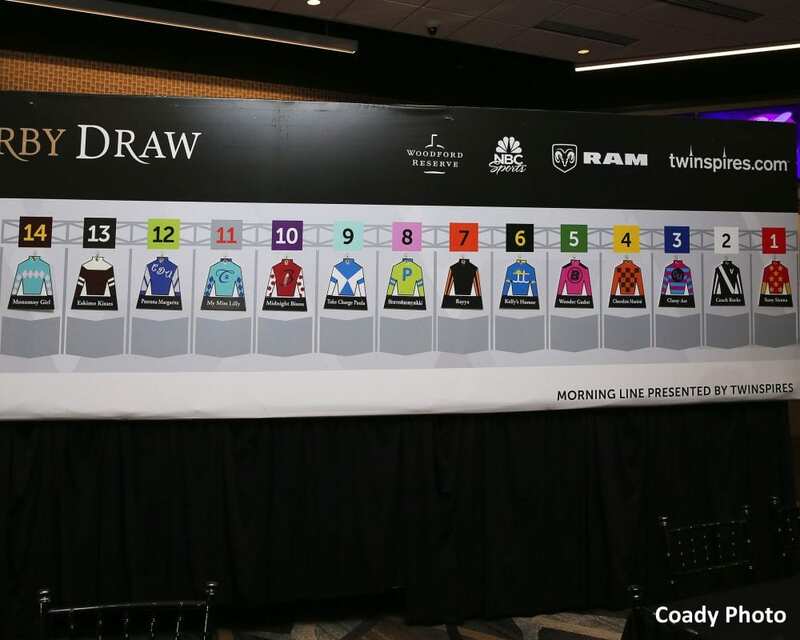 This entry was posted in NL Article, Racing and tagged Bill Spawr, brad cox, churchill, churchill downs, Florent Geroux, kentucky oaks, midnight bisou, mike smith, monomoy girl by Press Release. Bookmark the permalink.